AllegroMedical.com makes an assortment of premium IV needles/catheters and infusion/IV supplies readily available. You’ll find a wide array of products, and some of the best brands, when you shop for your IV needles/catheters and infusion/IV supplies here. 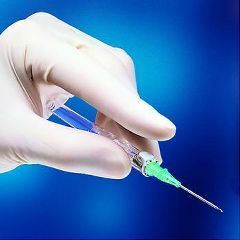 Whether you need a single use needle holder, clave connector, catheter system, syringes, filtration needles or any other type of IV supply, you will find premium options from leading brands like BD, B. Braun, ICU Medical and Bard, among others. AllegroMedical.com offers only the highest quality IV supplies, infusion supplies and other accessories at the lowest prices guaranteed. See our Best Price Guarantee for more details. PROTECTIV-W Safety I.V. Catheter - 20G x 1 1/4"